Bea's parents are divorced, her father remarried, and her mother taking advantage of the social upheaval of 1967 to travel in order to report on it. When Bea ends up having to spend her summer with her grandmother, she's not entirely upset, since her young stepsister loves her a little too much! "Pidge" as her grandmother wants to be called, has been forced to move from Boston to a retirement community in California so she can be near Bea's father, and she's not happy with the new, plastic feeling apartment that she has. As soon as Bea's father leaves them alone, Pidge comes up with a plan; she and Bea are going to get on a train and go to Atchinson, Kansas to meet her sister, who really happens to be Amelia Earhart. Over the years, Pidge has gotten letters from her sister, and the last one suggests meeting at the house where they grew up. An epic road trip ensues, with train, bus, hitch hiking with a hippie, and even an airplane ride, much to Pidge's chagrin. After all, if your beloved sister supposedly perished in a plane crash, would you be thrilled about air travel? The details of traveling in the 1960s, and Pidge's reluctance to actually buy tickets, are the most delightful parts of this book. We get to have a champagne dinner in the dining car of The Super Chief, but then get thrown off; we spend the night in a bus station and eat bananas and Twinkies Pidge has in her purse; we get to walk through the dessert and get picked up in a "woodie" station wagon by a very picturesque 1960s painter! A lot of time, travel books ignore the details of getting dirty and being unable to clean up, or the difficulty of lugging bags around. I really felt like I was traveling with Bea and Pidge, although I would have been more prepared! While Amelia Earhart did have a sister called Pidge, the book is clearly fictional. It is, however, extremely well researched. Details of daily life in the 1960s are spot on, with the possible exception of Pidge wearing slacks in her 70s. None of the women in my life wore slacks during this time period, but I lived in Ohio and not on the fashion forward, daring west coast! Readers are also introduced to information about Earhart's travels and childhood in a way that will encourage them to seek out books like Candace Fleming's Amelia Lost. Bea's relationship with her grandmother is also just right. The two haven't been close, but soon warm to each other's eccentricities. Middle grade readers who have spent a lot of time with their grandparents often find them to be the most sympathetic adults in their life, and those who don't know grandparents well often long for them. Bea's confusion and delusions are serious but not dangerous, but middle school is often a time when readers see grandparents becoming more frail. I liked how Behrens handled the grandmother's condition, and the portrayal of the divorce and step family will also speak to the experience of many readers, or give them insights into how other families live. 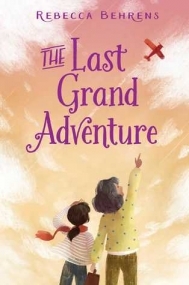 Like Blume's Julia and the Art of Practical Travel or Bustard's Anywhere But Paradise, The Last Grand Adventure transports family drama into an interesting and vibrant time period and shows us that while fashions, types of travel, and acceptable breakfasts (sugar sandwiches!) have changed over the last 50 years, family ties have not.